Obiano of the All Progressives Grand Alliance (APGA) in early lead. 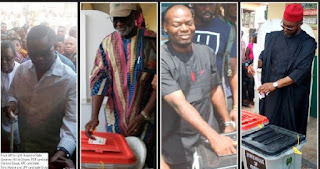 Tony Nwoye, the candidate of the All Progressives Congress (APC), is also reported to be doing well, while Oseloka Obaze of the Peoples Democratic Party (PDP) expressed confidence that he would win. However, the election was characterized by low turnout of voters, late arrival of election materials and delay in commencement of voting, as well as Card Reader malfunction in many polling units. But, the voter apathy had nothing to do with the threat of the Indigenous People of Biafra (IPOB) that voters should stay away from polling units. Indeed, the exercise was generally peaceful and violent-free across the state. An INEC Commissioner, Prince Solomon Soyebi, said the delay was partly because of the late arrival of some of the National Youth Service Corps (NYSC) members who were recruited to participate in the exercise. He said in addition to a mix-up in the deployment of the NYSC members to polling centres, some of them reported late because they came from far places, including outside the state. Soyebi who spoke at the polling centres located within the Community Primary School, Amawbia also confirmed that some Card Readers had some faults and could not identify finger-prints of some voters, but, said such Card Readers were immediately replaced. According to the Director-General of the Obiano Campaign Organisation, Chief Victor Umeh, the low turn-out recorded during the governorship poll did not come as a surprise. He said governorship elections in Anambra State since after 2003 general elections had always recorded voters’ apathy. Umeh, the former National Chairman of APGA, said the development had nothing to do with the earlier order by the now proscribed IPOB. He said most people take election days as holidays, and that they rather stay in their homes and rest. Voting started late in many polling units. For instance, at 12.57pm, when The Nation called at Polling Unit 001, Ward 1, located at the Umuchu Civic Centre, Aguata Local Government Area, election materials and officials of the Independent National Electoral Commission (INEC) had not arrived. The above polling unit, which is located in Anambra South Senatorial zone, is where the candidate of the Progressives People’s Alliance (PPA), Chief Godwin Ezeemo, registered and expected to cast his vote. Aroma Polling Units 1 and 2, Awka Ward 1, Awka South Local Government Area, which are about 100 meters from the INEC head office, the exercise commenced relatively earlier at about 9am. Most of most residents stayed indoors throughout the duration of the election. All markets in both urban centres of Awka, the state capital, Onitsha, the commercial hub, Nnewi, the industrial town and Ekwulobia, as well as those in the rural areas were deserted. The roads were also deserted, except the presence of the security personnel, including police and army who mounted road blocks at various strategic locations on the roads. There was a high incidence of Card Reader failures. INEC officials resorted to use of incidence forms to record particulars of voters who card-readers could not identify their finger prints after accreditation before they were allowed to cast their votes. Electoral officials were idle in many polling units in Awka, Umuchu, Agulu, Nri and Amawbia, particularly earlier in the day. The governorship candidate of the PPA, Chief Godwin Ezeemo, lamented the late arrival of electoral materials and INEC official at his polling unit. It was learnt that voting started at the unit about 1pm. He expressed frustration over this development, saying it was a deliberate ploy to deny him and his supporters the opportunity to exercise their voting right as Nigerians. He said: “I am not desperate to be governor, but I’m worried about the way we are treating ourselves. I’m worried about this nation. The ruling class wants to impoverish this nation. Just like in most other polling centres visited where low turnout of voters were observed, in Aguluzogbo Ward 11, polling Centre which has a total of 573 registered voters, only 184 cast votes at the end of the exercise. The Presiding Officer, Miss Tamunoibuomi Felix stated that the exercise was very peaceful and that voters and political party agent conducted themselves peacefully. Allegations of rigging also trailed the conduct of the election. For instance, an elderly man was arrested at the Community Primary School, Amawbia, sharing money to prospective voters. The money was carried in a; Ghana-must-go’ bag. Soyebi assured that the man will be dealt with. Reactions have started pouring in, as the results of the election filter in gradually. The National Chairman of APGA, Dr. Victor Umeh, said it was the peaceful atmosphere that surrounded the election was what gave his party victory. While commending the National Chairman of INEC, Prof. Mahmoud Yakubu, and the Inspector General of Police, Ibrahim Idris, for a peaceful, free and fair election. He said the results so far collated showed that APGA was leading comfortably; adding that anything short of that at the end could lead to anarchy. He also said that APGA had equally won the Idemili North Constituency election, which was conducted to fill the vacuum left by the death of the member who occupied the seat. Sen. Joy Emodi while reacting to the development described the governorship election as the best so far in the state. She spoke after voting at her Odoakpu Ward 4, in Onitsha yesterday, said her happiness was that those who were threatening fire and brimstone did not succeed in causing mayhem. In Enugu-Ukwu Ward 1, where the Deputy Governor, Dr. Nkem Okeke voted, APGA polled 116 votes, PDP zero and APC 28. Dr. Okeke described the election as free, fair and credible. Umeh also expressed satisfaction with the manner the governorship poll were conducted, but he said until what were collated reflected the real votes cast he would not say that the entire process was credible and transparent. A total of 4609 polling units were provided by INEC throughout the state for the governorship poll for 2,150, 000 registered voters to exercise their franchise between 8am and 2pm.